Prestage Foods of Iowa is nearing completion of its state-of-the art processing plant in Eagle Grove. It’s expected to bring more options for marketing pigs, more jobs and increased feeding of Iowa corn and soybeans. The plant also is designed with features that will limit the its environmental footprint, company officials say. Prestage Foods of Iowa broke ground on the $300 million project in March 2017 in Eagle Grove. It’s expected to come online in January 2019. On a recent tour there, workers installed machinery and equipment. 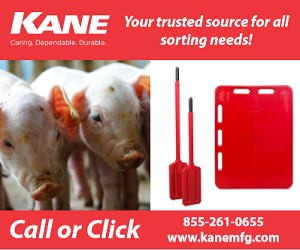 The capacity of the plant during a single shift will be 10,000 pigs per day, with an annual target of 2.6 million pigs harvested, says Eric Hogle, pork procurement director for the plant. Most of the pigs processed in the facility will come from farmers who raise pigs under contract with Prestage Farms, Hogle says. The rest will come from independent pig farmers, mostly in Iowa. The plant will provide one more marketing option for farmers in the state, Hogle said. “Previously, some producers have been tied into only being able to go to certain processors because of their geographic location. With this processing plant being built really in the middle of five other processing plants that are owned by three different entities, they have one more marketing option,” Hogle said. This new plant means more competition for pigs — and higher prices for farmers. That’s a good thing, says Gregg Hora, president of the Iowa Pork Producers Association. “The increased shackle space is needed in the industry because of the growing pig population and the increased productivity, so Iowa pig farmers welcome Prestage Foods in bringing forth additional packing capacity,” said Hora, who is a contract pig grower for Cactus Family Farms and grows corn and soybeans. The U.S. Department of Agri­­culture (USDA) predicts in­­creased pig marketing between November 2018 and February 2019, so the plant comes at a good time, Hora says. “We have realized that with the increase of sow numbers and pig productivity based on those USDA reports, that welcoming Prestage Foods to start their harvest facility in late 2018 and ramping up into January 2019 could not have come at a better time for keeping pig movement current,” Hora said. The plant is also a value-added opportunity for corn and soybean growers in Iowa, says Iowa Secretary of Agriculture Mike Naig. “This is all about value-added agriculture in Iowa,” Naig said. “We take that commodity — corn and soybean crop — and have the opportunity to feed that to something to add value — in this case, livestock. But then we have an opportunity to further add value by doing that processing right here in the state. Having plants like this come online and capture more of that value in our state in terms of employment and salaries and taxes paid and all that economic activity that goes into a facility like this is a good thing,” Naig said. Grain farmers are an important piece of the system, says Ron Prestage, president of Prestage Farms of South Carolina and Mississippi. Though built as a single shift plant, Hogle said the area surrounding the plant has been designed to accommodate a second shift in the future. “At the end of the day for us to compete in this market, we’ve got to have high-quality product that is at the top of the ladder on food safety and consistency,” Ron said. The company expects to process about 600 million pounds of pork annually. About 45 percent of the pork produced at the plant will go to other plants to be further processed into bacon, ham, sausage and other products. The rest of the products will be sold through grocery stores and other meat retailers. The company says it expects to export about 25 to 30 percent of the total pork produced at the plant. The company is now hiring about 1,000 employees for its single shift operations, says Jere Null, chief executive officer of Prestage Foods of Iowa. “We believe we will be a very attractive choice because of the opportunities we can give people,” he said. For some, like Hogle, a job with Prestage Foods of Iowa meant the opportunity to return closer to his family. “This was an opportunity for me to come back home and still stay in the pork industry,” Hogle said. He grew up in Clarion, about 15 miles from the new plant. The plant was built with both pig comfort and the environment in mind, company officials said. “One of the commitments the company made when we came to Iowa was that we would use state-of-the-art strategies to reduce our environmental footprint,” Null said. Prestage Foods worked with the city of Eagle Grove to invest in a new wastewater plant that will service both the city and the plant, Null said. The barn where live animals will be held before processing will utilize air-scrubbing technology. The system will allow the company to do nine air changes per hour, filtering outbound air and exchanging it for fresh air. “The fresher the air, the happier the animals are and the happier the people (working inside the barn) are,” Ron said. A wastewater lagoon will be capped, lessening the potential for odor, according to Null. The capped system allows the collection of methane gas, which is then burned in a boiler for energy reduction and to eliminate the source of odor from releasing methane gas into the atmosphere, he said. A thermal oxidizer — just the fourth used in the United States — is a part of the plant. It will help mitigate the rendering plant odors.“The purpose is to eliminate the volatile gasses and everything that has a potential to release an odor,” Ron said. The plant’s efficiencies and high-tech equipment will allow for about a 25 percent reduction in water usage than plants built 25 years ago, Null said. Much thought was put into creating a better environment for both workers and pigs, Ron says. Fresh air exchanges for pigs and people, heated floors in the holding barn during the winter and a Dr. Temple Grandin-approved working facility eases the stress on both people and pigs, Ron said.